There was little funny about a war in which 620,000 humans died. But it was finding humor amid devastation that kept Civil War soldiers marching toward the enemy. Union or Confederate, those in command proved adept at making mistakes. Many leaders were drunkards, couldn't speak English, didn't know a cannon's breech from its muzzle. Among the galleries of heroes were: Colonel Edward Baker, who told his Federals to follow the plume of his hat if they wanted to find war--and sent them over a cliff in a panicked retreat; General Felix Zollicoffer, who wore a white raincoat so opposing Federals could see him--but not his eyeglasses so he could see them; Thomas Selfridge of the Union navy, who "found two torpedoes and removed them by placing his vessel over them"; Colonel Alfred Rhett, a captured Southern blue blood whose fancy boots proved too small for every Union officer who coveted them; rum-drinking James Ledlie and dance-instructing Edward Ferrero, generals who kept each other company in a Union bombproof while their men faced slaughter. 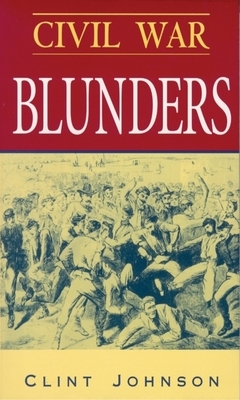 From Fort Sumter to Appomattox, Civil War Blunders traces the war according to its amusing, often deadly miscues. Lurking behind every significant action, as readers will discover, was someone with a red face. Clint Johnson is a native of Fish Branch, Florida, who has written eight books about the Civil War, as well as biographies and newspaper and magazine articles. He received his journalism degree from the University of Florida, and now lives in North Carolina. Clint Johnson is a native Southerner whose Scots-Irish and Welsh ancestors first settled in North Carolina in the 1730s and 1760s. One of those ancestors owned more than 100 acres on Manhattan Island, New York in the early 1760s, which he leased to the island's government for 99 years. When a grandson tried to reclaim the land for the family, those New York Yankees claimed their deed book had been lost in a fire and they would not honor the legitimate claim. As late as the 1920s, members of Clint's family were trying to sue New York City for the return of their property. Clint counts Confederate soldiers from Florida, Georgia, and Alabama among his more recent ancestors. He is a native of Fish Branch, Florida, an unmapped community of orange groves, cypress bayheads, cattle ranches, panthers, bobcats, alligators, and friendly neighbors. Fish Branch is what Florida was before Walt Disney World changed the state. He graduated from high school in Arcadia, Florida, the cow town whose wild and wooly residents inspired many of the cowboy paintings of Frederick Remington. He then graduated from the University of Florida with a degree in journalism. Fascinated with The War for Southern Independence (Northern readers can call it The Civil War if you wish) since the fourth grade, Clint has written eight books on The War. One of his favorite projects was helping Clarence "Big House" Gaines, one of the nation's best basketball coaches, write his autobiography. Clint has also written two corporate biographies, and hundreds of newspaper and magazine articles on business, history and travel. Clint, his wife Barbara, their cats, dog, and horse live in the mountains of North Carolina near where the Overmountain Men gathered to go fight the Tories at Kings Mountain, South Carolina, in the American Revolution.